I first met Charlie in 1986 or 1987 when there was a TSB Schools of Sport week at Inverness. I had invited Gerry Barnes up from Blackburn since he was the North of England staff coach for 5000/10000m and Charlie came along to give us a hand. He knew all the athletes, filled us in on their backgrounds and helped with the coaching and administration. Our respect for him grew over the week and has continued to grow over the years since then. I have known several of the athletes and coaches that he has worked with and they all speak highly of him. He has worked at local, district, Scottish and British national levels as administrator and coach, he has been a very good club man representing the club in many events on the track as well as on the roads, he has worked with all age groups – indeed his current Power of Ten profile has him coaching athletes from Under 15 to veteran, male and female. I asked him how he got involved in the sport and his response is below. “I suppose sport always figured in our family as my twin brother Gordon and I used to be encouraged to race each other at every opportunity. Also our older sister Sandra was no slouch and was North Schools 220yards winner to her credit. Egging us on was my late father who was a top sprinter up here in the North and clocked 10 1/5secs for the 100yards on grass tracks with no specific training. His claim to fame was he competed against Iain Young who was Scottish Champion and Olympian at the time and held him off in the old North District 100yds Championships at Forres over a 1 yard handicap. He also had other trophies and medals that that we goggled at as young boys for swimming and football where he had a spell with Inverness Clachnacuddin. As Gordon and I went through school, sports days became a place to shine for me rather than the classroom, although Gordon was slightly faster than me in primary I emerged as the better sportsman in secondary school and competed in many school events under the guidance of my PE teacher – the well known North District and Scottish Athletics official Colin Baillie. Colin who later team managed Inverness Harriers in the Scottish Leagues was very passionate about pupils in schools taking part in sport especially rugby and athletics and I did my first formal athletics training under Colin at Millburn Secondary School in Inverness. In first year I remember coming second in an Inverness Area Schools cross country event which I think I could and should have won had Colin not told me to sprint through the finish a lap too early. When I think back to the sessions we did especially the 300 and 400 reps and the recovery we got between each might be an indicator why my 800 time only hit about 2.11. Colin who is a good friend still and we talk quite a lot about school days. Although I did quite a bit of athletics in school my first love was football and as a 14 year old I must have shown a bit of promise and was totally elated to receive a letter from Desmond White who was then secretary of Celtic Football Club to say they were watching me. At sixteen I had Hearts knocking on the door and keeping tabs and at 17 had a two week trial with Aberdeen FC. It was about then I started to understand about more about speed (or maybe the lack of it in my case) as I played a couple of bounce games for Aberdeen reserves of which one was against the first team. I was centre half and given the job of marking Scotlands top scorer and Internationalist over the last 2 years Joe Harper. When I watched him on the telly he always looked a bit squat and dumpy and during the game I was totally mesmerised how a wee guy like this could move so fast. He was a great guy though and was very encouraging to myself and another couple of lads on trial. I played Highland League with Nairn County for a while but I suppose I was an amateur at heart as the treasurer was always chasing me for my national insurance number so they could pay me which incidentally was £3 appearance, £3.50 draw and £4 for a win. I was not really interested in getting payed as playing for the team was more important and when players that took me through to training in their cars would try fiddle expenses claiming false passengers I moved on to play in another league and saw my football out there. I always did running through these times and always kept myself fairly fit during close season at football. In 1977 I married Liz and we now have 3 children (who all have 2 children each so 6 grandchildren keeps us both on our toes). During the period they were growing up I got the running bug during the boom of the early 80s and when Neil our oldest was about 10 I took him down to Inverness Harriers and in 1985 I joined the coaching staff. It was quite a baptism of fire and I was thrust into things that were taking me out of my comfort zone and had to learn quickly about thinking ahead especially with about 40 kids in your charge. I also quickly realised that all these years playing football that it did not teach you much about how your body works and adapts to specific things, why we warm up etc. etc. I can honestly say that my first 6 months athletic coaching taught me more than all the years I was involved with football. Another athlete I was managing to hold off at the games was up and coming star 14 year old Jamie Bowie whom I had under my wing for a few years in his early running career. Jamie went on to become Inverness Harriers most successful ever athlete competing in the 400mtrs picking up medals at World and European Championships as a Junior and Senior member of the Great Britain 4 x 400mtr squads. Getting invited to be a National Team Manager of this commission in 1994 was a great honour and the start of a 15 year journey of managing and coaching with Scottish Teams. From the humble beginnings of Celtic Games Teams where your character is fully tested looking after the young stars to the Senior Teams where I witnessed and worked with some great athletes, managers and coaches along the way. (Too many to mention) In 2000 I was selected along with Pat Rollo to be the Team Managers for the first Commonwealth Youth Games which were held in Edinburgh. Following on from this I was selected to be male Senior Team Manager for Great Britain in the GB v USA v Russia International in Glasgow. This was great experience for me especially the GB Match as there were all the International Stars on show including Paula Radcliffe, Jonathan Edwards and Bob Weir who is an absolute gentleman. However the greatest honour for me will always be getting to manage or coach with Scotland`s Teams. Throughout that period of involvement I travelled far and wide and trips to Cyprus, Greece, Belgium, France and all over Ireland and numerous trips to the Loughborough International each May. The only place I never got a trip to was Wales funnily enough. In Scotland after finishing team management I was asked to be one of the Regional Coaches and did that for 2 years while the project lasted and covered the Outer Hebrides which offers a great place to train for any athlete but especially endurance with some great dunes on the West coast. I also covered Shetland and Orkney it was here I got to know Piotric Haczek who had just taken up the role of National Sprints and Hurdles Manager for Scottish Athletics. Piotric was a Polish athlete who mainly competed in the 400 metres. An outdoor and indoor world champion in the 4 x 400 metres relay, his success came mainly in relay, his best individual performance being a gold medal at the 1999 European Under 23 Championships. I learnt a good bit from him as I still had Jamie Bowie under my wing and when Jamie went to University in Edinburgh I managed to get him fixed up with Piotric and the rest shall we say is history. Going away with teams was a great learning experience and sitting chatting in the bar in the evenings was better that any coaching conference where discussions went on well over time. Hugh Murray, Mike Johnstone and Brian Whittle always were good for getting things going. I always managed to take something that I had learnt back home to my groups and hopefully (at least I like to think I did) make them better athletes because of it. I think back to the first athletes I coached Grant McDowall and Stephen Hendry in 1986 and wonder what if they were about now with all that I have learned since these early days. But I am sure we all as coaches say “If I knew then what I know now”…… Both Grant and Stephen were very good U17 800mtr runners and they would knock lumps out of each other in training. Stephen did 1.55.60 (club record for that time) and Grant 1.56.20. It was not until 2012 before that record was broken by Sean Chalmers who I picked up from a schools competition a couple of years before and he took it down to 1.54.79 when he finished 4th in the Under 17 AAAs Final at Bedford. Sean has since gained a scholarship in Lamar University, Texas and I am pleased to see his running is going from strength to strength. Around that time Mhairi MacLennan was breaking through on the cross country scenes picking up National vests and still is under the expert supervision of John Lees another coach I met on National duties. Of the group from that period and currently the one that is making a big breakthrough in such a short space of time is Stephen Mackay and now can claim to be a hot prospect for the future. He has now lowered his 800m time to 1.50.39 and in all my time coaching I have never met a more committed athlete. All he has achieved has been done locally without any financial support as he has travelled long distances to get the right competition out of his own pocket. He will deserve any success he gets. Sandwiched in between are many junior and seniors I have coached with many making National Junior teams as sadly for me we have not had the luxury of a University in Inverness (until 2015) and all athletes have I have had to move on to other coaches as I believe you cannot coach at a distance, some may disagree but I feel it`s not fair on the athlete that needs on hand support. Seniors are different. The most successful XC Inverness Harriers had was in Dundee in 1993? when we had an individual winner with Under 15 boys race with Stuart MacKay who also led the team to gold which was followed up with bronze medals for the under 17 men and under 20 men`s teams that year. 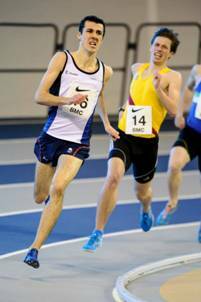 Others to mention would be Simon McIntyre who as an Under 20 finished the year top Scot for 1500m and 9th in the UK rankings with 3.51.86. He picked up track and field Internationals as well as Cross-Country vests and proudly boasts to be the only Inverness Harrier to beat a young Mo Farrah in a Cross-Country meeting. I have also coached an Olympian although she was part of the GB 2012 Modern Pentathlon Team, Mhairi Spence was also selected for a Celtic Games Cross-Country in Ireland when we had a good going group in that period and others then making national teams were Jennifer Main and DJ McAuley. Disability Athletes have also been under my wing lately as part of my work is to identify and find coaches for them. Jason MacLean was part of the 2014 Scottish Commonwealth Games Team and finished 5th in the final of the T37 100mtrs. 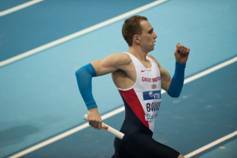 Paul Davidson a T20 400 runner is now making his breakthrough and has just been selected for the British Athletics Futures Squad 2015/16 and has his target set for Rio 2016 Paralympics. With both these athletes again travelling to other countries has been part of the journey with Jason competing in Dubai and Paul in Italy. 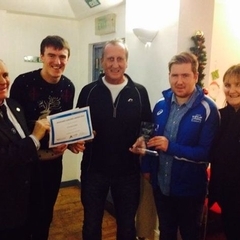 Recently he picked up another 2 awards one for The Highlands and Islands Regional Disability Coach and was honoured to receive the Inverness Area Sports Council award for Coach of the Year. As an administrator Charlie has worked at club, district and national level. A former club president at Inverness, when the Scottish Athletic Federation came into being in 1995, Charlie was the North Area Representative on the council and sat as Chairman for the North District Cross-Country Committee as well as secretary over a period of years between 1995 to 2014. He officiated at the 2003 European Cross-Country Championships and 2008 World XC Championships when they were held in Edinburgh and last year was a Technical Official at the 2014 Commonwealth Games in Glasgow. Coaches, officials and administrators often have to fight their corner and in a place as remote from the levers of power as Inverness this is even more the case. Athletes in the north are lucky to have men like Charlie Forbes to go into bat for them.